Of Course The Video Don't Do Justice To The Loudness Of This Horn. A Must for your Hotrod or Custom!! Louder than OE Car Horn!! *Mirror Finish-Will look like new for years to come. *Works on any 12v system. *Easy to fit in small compartments. 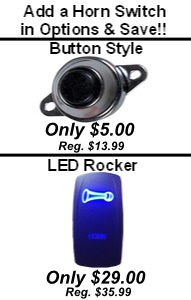 This Assured Performance Ahooga 12v Electric Horn will give your car, truck, cart, UTV, anything a unique horn sound. This ACHRKS-612c is a replica sound close to the old Ford Model T Klaxon. This horn is easy to install with a single bolt mounting configuration. Install time is typically less than 1 hour.